Sveiki, gamintojas deklaruoja, kad vairas suderinamas su PC. Dėl kaprizų negalime nieko pakomentuoti. Experience every racing sensation to the fullest thanks to the realistic Force Feedback – the road or track's relief, loss of tire grip, braking, bumps and impacts, etc. 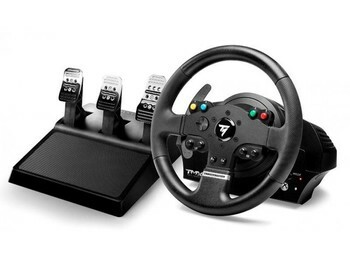 A smooth, precise and silent racing wheel, featuring a mixed belt-pulley and gears system.